Skin belies aging like no other organ. It takes all the blame, while in fact it only reflects what it covers. The skin is the outermost organ of our body. Its purpose is to cover our deeper structures and first of all, the muscles. Starting at about age 25, our muscles start to become measurably older… and smaller. By age 50, most of us have lost half or more of our muscle mass. Result: there is more skin to cover less muscle volume. Muscles do more than help us to lift and jump and run. The heart is a muscle, as you well know, and its function is to pump blood. But did you know other muscles do the same thing? Not in the literal pumping sense of the heart. But consider… Arteries and veins are the conduits or “hoses” through which blood travels. Blood is pumped away from the heart and lungs through the arteries and it returns to the heart through the veins. It is muscle movement which gives the extra oomph your blood needs to flow fully. Every 7-10 years, most of the cells of the body are totally renewed. This process of cell renewal means that at every moment in our body there are millions (may be even trillions) of dead cells. They are decomposing and releasing strong poisons which permeate through all the pores of the body. This situation is not dangerous since your body can neutralize and expel such poisons, but this is only possible if all the capillaries and the entire circulatory system is functioning properly. For skin to stay young, flexible, hydrated and smooth, it needs a good, strong, steady blood supply. Muscle movement squeezes blood vessels, and helps the blood move along. So it is exercise that keeps your blood pumping well—including the blood which flows to the skin of your feet, legs, torso, arms, hands, and, yes, your face. We lift weights, do aerobics, but somehow we don’t get to deliberately exercising the muscles of the face. 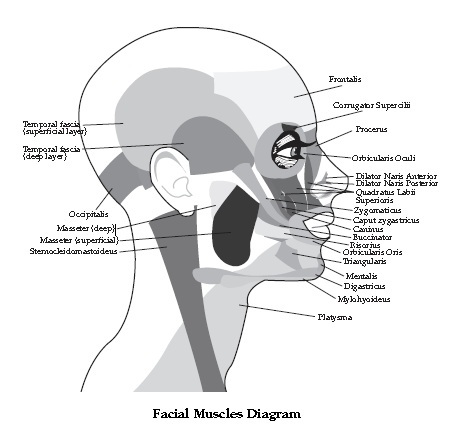 There are over one hundred muscles in the head and neck alone! With age, the blood-supplying function of these muscles gets disrupted. Some are overworked, while others lack stimulation. If we train our muscles, they can quickly become “younger.” Why do we care if the interior muscles that we can’t see are youthful? Because healthy, youthful facial muscles will guarantee that the cheeks won’t sag and the jowls won’t droop. Through facial exercise you can prevent or remove a double chin, reduce or eliminating “sunken eyes” and “dark circles.” But that is not the only benefit. A facial workout improves blood circulation and that’s what improves the condition of your skin. What’s wrong with so many cosmetic treatments and even some cosmetic surgeries is that they focus on the skin as if it functions in isolation from the rest of the body. Your body is a system. No part works in isolation. There’s no real health, and no real beauty, until we treat that entire system right. 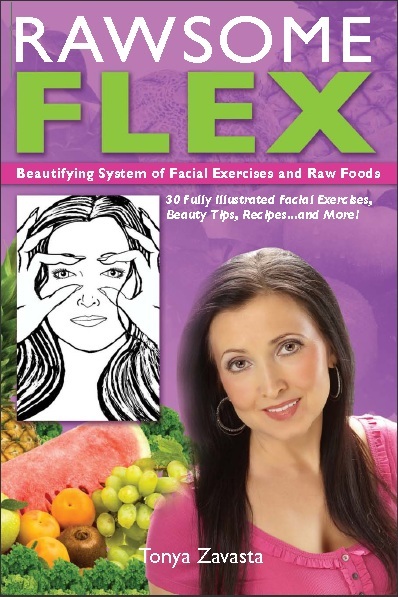 The Rawsome Flex: Beautifying System of Facial Exercises and Raw Foods does for the face what lifting weights and practicing yoga do for the body. The program includes exercises and facial massage that are designed to contract and relax the facial muscles. Stimulate your facial muscles regularly, and your face will retain—or regain—its elasticity and youthfulness! Facial Exercises: How Soon Will I See Results? Chemical Peels: Why Would You Want One?